Without a doubt the competition that attracts the most attention in the County presently is Scór na bPáistí. This competition which was first introduced in 2004 and especially aimed at the promotion of Scór amongst school children of National School level. The whole idea for the competition was the brainchild of the late Siobhan Cotter R.I.P. herself a Primary School teacher and Secretary of Scór na nÓg in the County at that particular time. 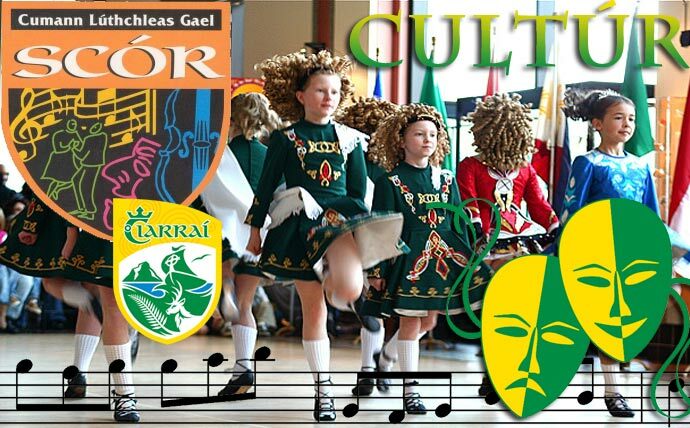 The competition is similar to both Scór Na nÓg and Scór Sinsear with just one extra discpline which is Sean Nós Dancing; so the nine disciplines to compete in are; Figure Dancing, Solo Singing, Recitation, Ballad Group Sean Nós Dancing, Léiriú, Instrumental Music, Set Dancing and Quiz. Thankfully Siobhan’s vision has proved to be a resounding success and is going from strength to strength each year since its foundation with hundreds of National School children taking part at District level and continuing to County Final level. There will be nine Districts Boards represented; Mid Kerry, South Kerry, East Kerry, Kenmare District, West Kerry, North Kerry Football, North Kerry Hurling, Castleisland District and Tralee/St. Brendans. There will be medals for both winners and runners up; also the Siobhan Cotter Memorial Shield, sponsored by Estuary Print, Ballylongford which was introduced in 2008 by the Coiste Scór Chiarraí will be on display and presented to the overall Club at the end of the competition. A further presentation will also be made to the Club who has participated most in Scór discplines over the duration of competitions which takes in; Scór Sinsear, Scór na nÓg and Scór Na bPáistí and will be known as the Healy/O Connor Perpetutial Cup which was kindly jointly sponsored by “Trophy World”, Tralee and Estuary Print, Ballylongford. This competition finishes at County level and will come to a conclusion at this stage. Saturday March 23rd at 4pm for the North of the County; (North Kerry Football, North Kerry Hurling, West Kerry, Tralee St. Brendans, Castleisland District) Venue will be St. Josephs Secondary School, Castleisland. Sunday March 24th at 2pm will see East Kerry Board, South Kerry Board, Kenmare District and Mid Kerry come together at the Community Centre Foilmore. A huge attendance is guaranteed at both venues with 2 from each category qualifying for the County Finals which is pencilled in for Saturday April 6th in the Glenbeigh Community Centre, 4pm. Then at the earlier time of 2pm the County Finals of Tráth na gCeist will go ahead at the same venue.